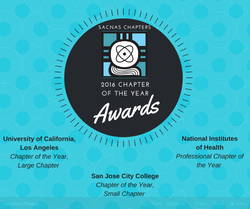 SACNAS is dedicated to increasing the numbers of underrepresented students in higher education and in science. This group is open to undergraduates, graduate students, transfer students, community college students, post-docs, faculty and staff who share a common concern about equal access to education, who has interest in outreach and/or is in need of opportunities in academic leadership and participation. All majors and backgrounds welcome! Click here to see the latest news and updates! Sign up to receive the SACNAS at UCLA Newsletter! Our newsletters contain all the information for our upcoming events (general meetings, outreach events, etc). Sign up forms required to participate in our outreach events are only sent through this newsletter. You will only receive emails from SACNAS at UCLA. The newsletters are sent out approximately once every week. Click here to check out past newsletters!